Known world-wide for its famed fly fishing, a float down the Teton River offers a unique way to experience Teton Valley. 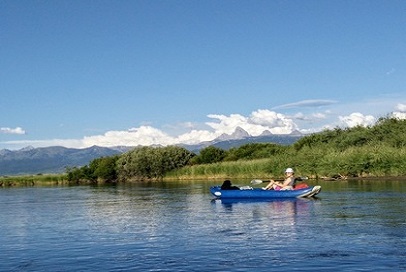 With views of the Teton Mountains and ample wildlife, the Teton River is something the whole family can enjoy. Our inflatable kayaks and stand-up paddleboards are the perfect way to experience the river. The Teton River flows south to north through Teton Valley, the access points described below are from south to north. Remember that the river banks are primarily private property. Keep dogs under control and pack-out all trash. Go South of Driggs on Highway 33, turn West (towards the Big Hole Mountains) on 5500 South. Continue down 5500 South until it dead ends at the Fox Creek Fish and Game Access. There is a short hike (~250 yards) to reach the river. 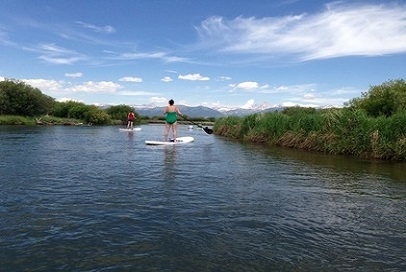 ​This stretch of river offers slow placid water best suited for our stand-up paddleboards. Float time is largely determined by how much you paddle. Go South of Driggs on Highway 33 turn West (towards the Big Hole Mountains) on 750 South. Follow the road until you cross the bridge. The river access will be on your left. ​This stretch of river offers slow shallow water best suited for our stand-up paddleboards. With sustained effort it is possible to paddle upstream from the boat launch. Kids who want to play in the water can do so from our rental kayaks, but be aware that leeches are not uncommon. Float time is approximately an 1 hour or less depending upon how much you paddle. At 3.8 miles from the stoplight, you will cross the Teton River on Bates Bridge. Just after the bridge is a very large parking lot on the left (south) side of the road. 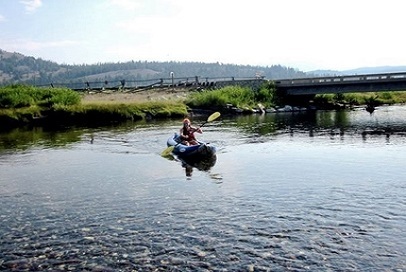 ​Bates Bridge is the most popular put-in on the Teton River. Downstream from here the river has numer﻿ous bends often with willow "strainers" along the bank. The river braids at one point with the left channel having the greatest water volume and shortest float time. Float time from Bates Bridge to Rainey is approximately 1.5 to 2.5 hours. At the Y intersection, continue driving straight west (do not follow the curve to the left/south) Drive west another 1.2 miles until you come to two metal silos on your right. Turn right (north) on the dirt road just past the silos. There is a brown Fish and Game Access sign at this turn-off. Drive north on this dirt road until you come to the Fish and Game Access sign. Turn right (east, towards the Teton Mountains) and drive until you reach the Rainey Access on the Teton River and the end of the road. ​Rainey is the second most popular put-in an the Teton River and the most common take-out. The river downstream from here has numerous bends often with willow "strainers" along the bank. Float time from Rainey to Packsaddle is approximately 1.5 to 2.5 hours. For those looking for a long float add on the previous section. ​With a character similar to that of the previous section this can be a nice alternative to the more popular floats on a busy summer weekend. Compared to the previous two sections there are more cows on this stretch. Float time from Packsaddle to Harrops Bridge is approximately 2.5 to 3.5 hours. The boat ramp is on the right hand side of the road before Highway 33 crosses the Teton River. ​This is your last chance to take off the Teton River. After crossing under Highway 33 the river eventually enters a canyon with class IV/V whitewater, suitable only for experienced boaters who know what they are doing. The Teton River is suitable for inexperienced boaters, but strong currents around woody debris can cause trouble for those that disregard the power of water. Generally a shallow river, be aware that deeper holes and cutbanks exists and that conditions change. Weather can change quickly and strong headwinds can dramatically increase float times. This is meant as a guide only - use your own judgement - and navigate the river at your own risk. Peaked Sports does not offer a shuttle service. If you need a shuttle, please contact one of the areas shuttle services for details.